The remarkable thing about the human race is our ability to botch things up even when the odds are undeniably in our favor. Our story began in the Garden of Eden—a lush paradise designed by God Himself and filled with “every tree…that is pleasant to the sight and good for food” (Genesis 2:9). A husband and his wife lived in this utopia, surrounded by the creation of a loving God and sharing in a close, personal relationship with their Creator. And all they had to do was keep their hands off of one tree. But they couldn’t do it. They succumbed to temptation. Satan came in and muddied the waters with lies and half-truths until Eve saw the tree as “good for food, that it was pleasant to the eyes, and a tree desirable to make one wise” (Genesis 3:6). So husband and wife took of the forbidden tree, the tree of knowledge of good and evil, and officially began the proud human tradition of “every man doing whatever is right in his own eyes” (Deuteronomy 12:8). Not much has changed since that historic sin. Adam and Eve got exactly what they asked for: knowledge of good and evil. What they didn’t get was knowledge of the defining line between the two categories—and for 6,000 years of human history, some of the greatest minds of our race have been engaged in a never-ending debate about where that line belongs. One of the more interesting ideas to come out of that debate is the concept of “gray areas.” The idea is pretty straightforward: if we define wrong and right in terms of black and white, then gray areas are actions that are ethically ambiguous. They’re harder to pin down as strictly right or wrong because they appear to contain elements of both. Maybe it’s a question of stealing…to keep your family from starving. Maybe it’s a question of lying…to protect someone else’s life. Or maybe it’s the classic question that ethics professors love so much about you standing next to a railroad switch with the opportunity to throw it and save someone’s life…at the cost of ending someone else’s. To be fair, the average Christian faces slightly less dramatic gray areas. I can’t remember the last time I stood by a railroad switch, pulling my hair out over an ethical dilemma while a train barreled toward a junction. You know what I do puzzle over, though? The kinds of entertainment a Christian should avoid. What constitutes an acceptable activity on the Sabbath. When and how a sin should be confronted. These and similar topics are extremely tricky when it comes to providing definitive answers simply because there are so many opposing viewpoints to consider. Whatever the gray area happens to be, we’re pretty much guaranteed a mental workout when we attempt to understand it. What’s the right course of action? What’s the wrong course of action? How can we be sure? Do you think God struggles with gray areas? If we answer yes to that question, then we need to very seriously consider how much faith we place in God’s omnipotence and omniscience. But if we answer no—if we believe that God is never uncertain about any action being right or wrong, that “His understanding is infinite” (Psalm 147:5), then we are faced with an immutable fact: There are no gray areas in the eyes of God. So what does that mean? If there are no gray areas from God’s perfect vantage point, we must conclude that there are no gray areas at all. What we perceive as gray areas are nothing more than illusions resulting from an imperfect understanding of God’s will. Here’s the real question, though: Why does this distinction matter? What difference does it make if gray areas are real or not when the effect on us is still one of confusion and uncertainty? It makes every difference in the world. Just because we can’t see God’s standards in a particular scenario, it doesn’t mean they aren’t there. Any action or thought can only fall into one of two categories: acceptable before God or unacceptable before God. There is no middle ground. When we find ourselves enshrouded by a gray area, we must keep in the forefront of our minds that, although the waters might be murky to us, they are perfectly clear to God. The boundaries between right and wrong are still perfectly defined, even if we’re having trouble perceiving them. The world loves gray areas, because it’s easy to treat gray areas as free passes. If the waters are murky—if black and white have blended into shades of gray—then judgment is impossible and anything goes. It becomes an excuse to act without restraint and without consideration, because, after all, who’s to say for sure what’s right? And if we have the audacity to suggest that there might actually be a concrete right and wrong, we’ll be met with criticism—we’re seeing things in black and white, refusing to consider the more nuanced, fuzzier areas of an issue. 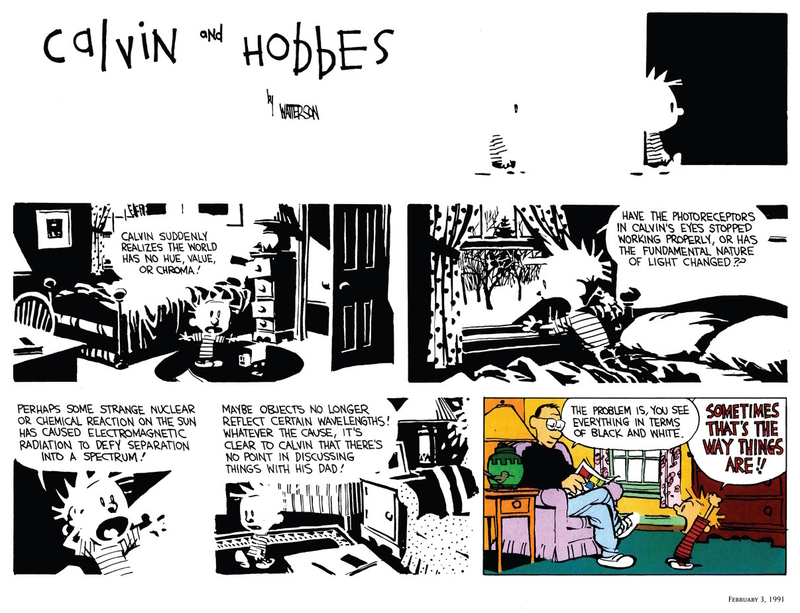 Watterson meant it as a joke, poking fun at the stereotypical dogmatism of a six-year-old. But honestly, when we get right down to the core of it, that really is the way things are. God created very definite boundaries between right and wrong, and however fuzzy they might look to us, they remain constant and unchanging. Christ warned “that servant who knew his master’s will, and did not prepare himself or do according to his will, shall be beaten with many stripes. But he who did not know, yet committed things deserving of stripes, shall be beaten with few” (Luke 12:47-48). Not knowing God’s will doesn’t excuse us from it—it is our constant duty to “grow in the grace and knowledge of our Lord and Savior Jesus Christ” (2 Peter 3:18). How do we do that? “To the law and to the testimony! If they do not speak according to this word, it is because there is no light in them” (Isaiah 8:20). God’s word contains the priceless wisdom we need to sharpen our discernment and draw closer to our Creator. That passage in Isaiah continues with a warning against those who walk outside the light: “They will pass through it hard-pressed and hungry; and it shall happen, when they are hungry, that they will be enraged and curse their king and their God, and look upward. Then they will look to the earth, and see trouble and darkness, gloom of anguish; and they will be driven into darkness” (Isaiah 8:21-22). The more time we spend embracing the “freedom” of gray areas, the closer we move toward the darkness. And that’s not where the children of light belong. 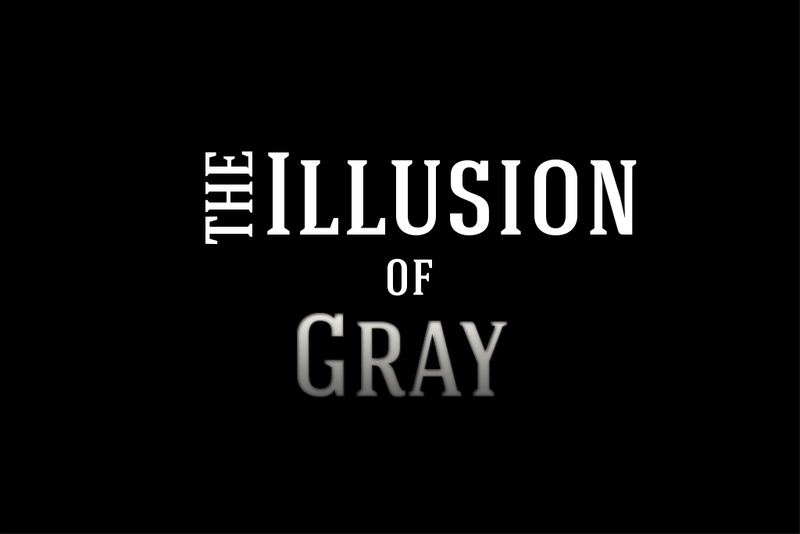 4 Responses to "The Illusion of Gray"
Thank you so much,what a great article.